On behalf of our colleagues on the International Scientific Committee, we are very proud to present the Preliminary Programme of the International Conference on LGBT (Lesbian, Gay, Bisexual and Transgender) Human Rights. The Conference will be the result of more than two and one-half years of work by more than 100 people around the world. We would like to thank everyone who has generously contributed their time to the organisation of this important project. We would also like to thank the 1st World Outgames Montréal 2006 and GLISA for the trust they have placed in us from the very beginning. In doing so, they have demonstrated their determination and their vision in linking the LGBT sports movement with the global fight for LGBT rights as human rights. This was a courageous and ambitious decision – one that we feel was, without question, the correct one. What the Outgames and the Conference have in common is defending the human right of every LGBT person in the world to participate fully, openly and equally in every part of life, without hiding their sexual orientation or gender identity, including in every sport, at every level, from their neighbourhood to the Olympic Games, and at every age, be it 18 or 88. We hope that, after reading the Preliminary Programme, you will share our belief that the Conference represents a breakthrough for the international LGBT community and, indeed, for the whole of humanity. One of the main purposes of the Conference is to raise the profile of LGBT human rights at the United Nations level and in other international forums and organisations, and to show national governments that LGBT human rights must be taken seriously as an international human rights issue. This should help us gradually to achieve our long-term goal: extending the legal and social equality increasingly enjoyed by LGBT individuals in Australia, New Zealand, Canada, South Africa, most of Western Europe and some parts of the United States, to LGBT individuals living in the rest of Africa, Asia, Eastern Europe and Latin America. 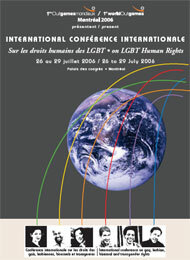 The International Conference on LGBT Human Rights will close in the early afternoon of 29 July 2006 with the presentation of the “Declaration of Montréal”: a statement of the human rights claims of the international LGBT community and this community’s demands for action by the United Nations, other international organisations, and national governments. Later that day, when we march into Montréal’s Olympic Stadium for the Opening Ceremony of the 1stWorld Outgames, this Declaration will be our flag. And it will be our legacy to the future and to Copenhagen, where the next Conference will be held during the 2nd World Outgames in 2009. We are expecting 2000 participants at the largest international conference on LGBT human rights ever held. Register today and be a part of history! We look forward to seeing you in Montréal on 26-29 July 2006!